2018 NRL GLORY is an updated and extended version of the 2008 Centenary of Rugby League trading card series. It commemorates the greats of more than 100 years of NRL history. This subset includes 99 NRL Hall Of Fame players plus 6 of the NRL Hall Of Fame Induction Class and 2 checklist cards. A Holographic Parallel of the NRL Hall Of Fame set. Numbered to 566 cards. A sketch style card set featuring portraits of NRL founders who played between 1908-1945. 400 cards of each produced. Between 2008 and 2018, there have been an additional 6 NRL Immortals nominated by the NRL. These Insert Sets follows follows on from the 2008 NRL Centenary release. 420 NUMBERED cards each released. Stuart, Gordan Tallis, Steve Menzies and Petero Civoniceva. 210 NUMBERED cards each released. 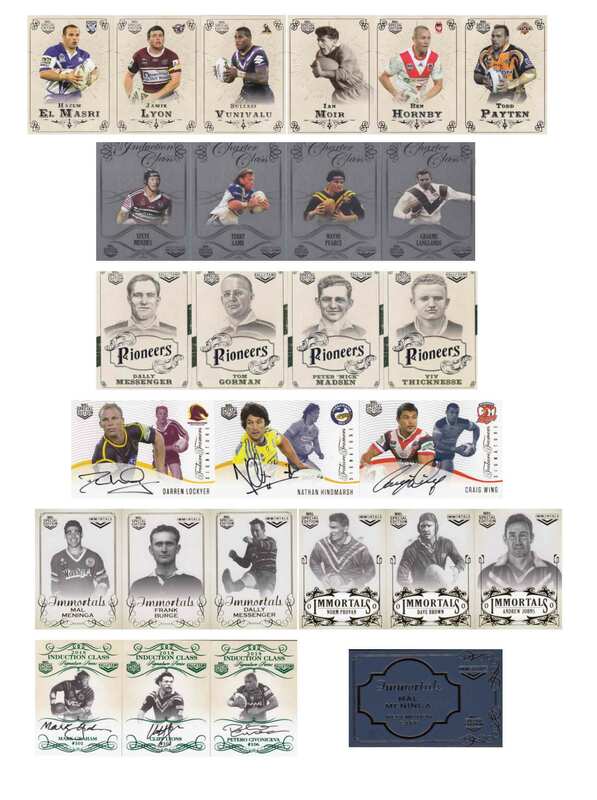 2008 NRL Centenary featured 7 Immortals Signature Cards. This release features a further 3. IMS8 and IMS13 are Authentic Signature cards of Andrew Johns and Mal Meninga. IMS9-IMS12 is one card featuring 4 immortal players with facsimile signatures or Photo only. 140 numbered cards for each redemption. These 12 Case Cards are oversized versions ( 4″ x 6 “) of IMP8-IMP13 and IMSK8-IMSK13. Limited to 70 numbered cards of each. This subset continues the Oversize Immortals cards from the Limited Edition 2008 NRL Centenary of Rugby League Master Set. Pre-Sale listings now available HERE!. We getting some breaks ready for this set?